Even though the numbers don't reflect a good quarter, there were clear signs of progress on the company's turnaround plan. 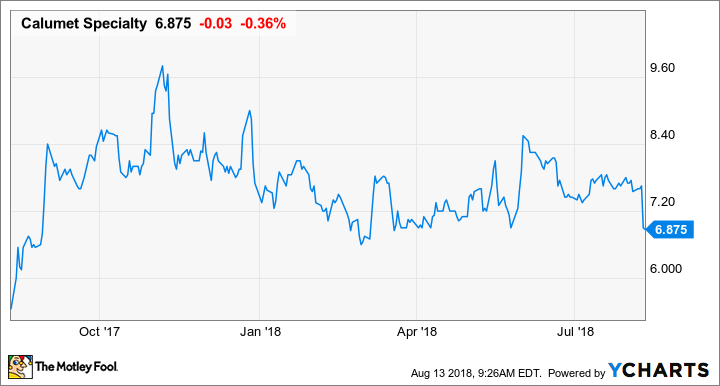 Whenever a company is in the midst of a multiyear turnaround plan like Calumet Specialty Products Partners (NASDAQ:CLMT), some quarters are going to show more progress than others. This past quarter was one of those less noticeable quarters as many of the moves it made were a detriment to the bottom line. Nevertheless, there were some reasons investors should be satisfied with what Calumet did in the quarter. Here's a brief rundown of Calumet Specialty Product Partners' most recent earnings results and why some of the things that hit the bottom line this past quarter were actually a sign of progress. DATA SOURCE: CALUMET SPECIALTY PRODUCTS PARTNERS EARNINGS RELEASES. It's a little strange to see an oil refiner produce weaker results compared to the prior year when so many other refiners reported blowout results. Working through these results, though, they aren't quite as bad as they look on paper. The first notable thing is that the company sold both its Superior fuels refinery as well as its Anchor oil-field services business, so there is a smaller contribution from its fuels segment than in the prior quarter. In fact, adjusting for the absence of its Superior refinery, management noted that adjusted EBITDA for its fuels segment was up 320% compared to this time last year. Also, it said that there was some unplanned downtime at one of its specialty products facilities that impacted output and margins. The last thing that impacted these results was a one-time charge of $58 million associated with the retirement of $446 million in debt outstanding. For longer-term investors, it's much more important that the company lower its debt levels than to be concerned with the occasional income statement hit from early debt retirement costs. Add all these things together and the company's second-quarter report doesn't seem nearly as bad. If there was one thing that was somewhat discouraging this past quarter, it's Calumet's seeming inability to take advantage of the price discrepancies between various crude oils that so many other refiners exploited in this past quarter. Even though Calumet produces fuel at its San Antonio facility -- very close to the Permian Basin and Eagle Ford shale -- it didn't run much locally sourced crude that sells at a steep discount. Calumet is trying to rectify this situation and now expects to source a considerable amount more crude from the Midland Basin. In Calumet's press release, CEO Tim Go's two highlights for the quarter were the deal to retire some of its debt early, how that fit into the company's long-term debt reduction plan and some of the initiatives management is working on to improve the profitability of its facilities. We remain committed to advancing our strategic priorities, which include reducing our leverage and growing our profitability. In the second quarter we fully redeemed our secured notes, meaningfully reducing our debt burden and lowering our interest expenses by $46 million per year. In addition, we started up a new isomerate unit at our San Antonio refinery, and the naphtha project at our Great Falls refinery, both of which will drive value enhancement and increase margin capture for our fuels segment in the second half of the year. Lastly, in June we increased our exposure to WTI-Midland based crudes from 6.5 kbpd to 10.5 kbpd to take advantage of wider crude differentials. As we move into the second half of the year, we will continue to seek out opportunities to enhance our yields, further reduce costs and expand our margins as we work to drive value for all of our unitholders. All things considered, this was a good quarter as the company made further progress on its long turnaround plan. While the results don't show up in every quarterly report, Go's efforts to improve operational performance, focus on its most profitable assets, and reduce its onerous debt load have been paying off. It's too soon to tell if Calumet has put itself in a position to start paying a distribution like all master limited partnerships should. Chances are, we are still a quarter or two away from that as management uses some of that cash to either pay down more debt or invest in some smaller margin-enhancing projects at its existing facilities. One thing is clear, though, it is on the right track to do so in the future.